Model XAE IFF kit, the first radio recognition IFF system in the U.S. Despite the name, IFF can only positively identify friendly targets, not hostile ones. If an IFF interrogation receives no reply or an invalid reply, the object cannot be identified as friendly, but is not positively identified as foe (it may, for instance, be a friendly aircraft with an inoperative or malfunctioning transponder). There are in addition many reasons that friendly aircraft may not properly reply to IFF. With the successful deployment of radar systems for air defence during World War II, combatants were immediately confronted with the difficulty of distinguishing friendly aircraft from hostile ones; by that time, aircraft were flown at high speed and altitude, making visual identification impossible, and the targets showed up as featureless blips on the radar screen. This led to incidents such as the Battle of Barking Creek, over Britain, and the air attack on the fortress of Koepenick over Germany. Already before the deployment of their Chain Home radar system (CH), the RAF had considered the problem of IFF. Robert Watson-Watt had filed patents on such systems in 1935 and 1936. By 1938, researchers at Bawdsey Manor began experiments with "reflectors" consisting of dipole antennas tuned to resonate to the primary frequency of the CH radars. When a pulse from the CH transmitter hit the aircraft, the antennas would resonate for a short time, increasing the amount of energy returned to the CH receiver. The antenna was connected to a motorized switch that periodically shorted it out, preventing it from producing a signal. This caused the return on the CH set to periodically lengthen and shorten as the antenna was turned on and off. In practice, the system was found to be too unreliable to use; the return was highly dependent on the direction the aircraft was moving relative to the CH station, and often returned little or no additional signal. It had been suspected this system would be of little use in practice. When that turned out to be the case, the RAF turned to an entirely different system that was also being planned. This consisted of a set of tracking stations using HF/DF radio direction finders. Their aircraft radios were modified to send out a 1 kHz tone for 14 seconds every minute, allowing the stations ample time to measure the aircraft's bearing. Several such stations were assigned to each "sector" of the air defence system, and sent their measurements to a plotting station at sector headquarters, who used triangulation to determine the aircraft's location. Known as "pip-squeak", the system worked, but was labour-intensive and did not display its information directly to the radar operators. A system that worked directly with the radar was clearly desirable. The first active IFF transponder (transmitter/responder) was the IFF Mark I which was used experimentally in 1939. This used a regenerative receiver, which fed a small amount of the amplified output back into the input, strongly amplifying even small signals as long as they were of a single frequency (like Morse code, but unlike voice transmissions). They were tuned to the signal from the CH radar (20–30 MHz), amplifying it so strongly that it was broadcast back out the aircraft's antenna. Since the signal was received at the same time as the original reflection of the CH signal, the result was a lengthened "blip" on the CH display which was easily identifiable. In testing, it was found that the unit would often overpower the radar or produce too little signal to be seen, and at the same time, new radars were being introduced using new frequencies. Instead of putting Mark I into production, a new IFF Mark II was introduced in early 1940. Mark II had a series of separate tuners inside tuned to different radar bands that it stepped through using a motorized switch, while an automatic gain control solved the problem of it sending out too much signal. Mark II was technically complete as the war began, but a lack of sets meant it was not available in quantity and only a small number of RAF aircraft carried it by the time of the Battle of Britain. Pip-squeak was kept in operation during this period, but as the Battle ended, IFF Mark II was quickly put into full operation. 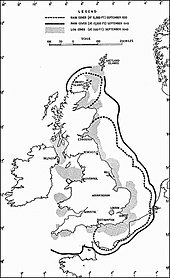 Pip-squeak was still used for areas over land where CH did not cover, as well as an emergency guidance system. Even by 1940 the complex system of Mark II was reaching its limits while new radars were being constantly introduced. By 1941, a number of sub-models were introduced that covered different combinations of radars, common naval ones for instance, or those used by the RAF. But the introduction of radars based on the microwave-frequency cavity magnetron rendered this obsolete; there was simply no way to make a responder operating in this band using contemporary electronics. In 1940, English engineer Freddie Williams had suggested using a single separate frequency for all IFF signals, but at the time there seemed no pressing need to change the existing system. With the introduction of the magnetron, work on this concept began at the Telecommunications Research Establishment as the IFF Mark III. This was to become the standard for the Western Allies for most of the war. Mark III transponders were designed to respond to specific 'interrogators', rather than replying directly to received radar signals. These interrogators worked on a limited selection of frequencies, no matter what radar they were paired with. The system also allowed limited communication to be made, including the ability to transmit a coded 'Mayday' response. The IFF sets were designed and built by Ferranti in Manchester to Williams' specifications. Equivalent sets were manufactured in the US, initially as copies of British sets, so that allied aircraft would be identified upon interrogation by each other's radar. "Alongside the switch to turn on the unit was the IFF destruct switch to prevent its capture by the enemy. Many a pilot chose the wrong switch and blew up his IFF unit. The thud of a contained explosion and the acrid smell of burning insulation in the cockpit did not deter many pilots from destroying IFF units time and time again. 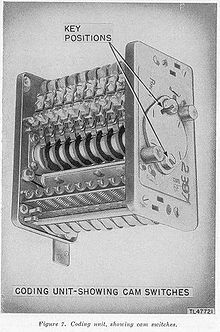 Eventually, the self destruct switch was secured by a thin wire to prevent its accidental use." FuG 25a Erstling (English: Firstborn, Debut) was developed in Germany in 1940. It had two bands tuned to the low-VHF band at 125 MHz used by the Freya radar and the low-UHF-banded 550–580 MHz used by Würzburg). Before flight, the transceiver was set up with a selected day code of ten bits which was dialled into the unit. To start the identification procedure, the ground operator switched the pulse frequency of his radar from 3,750 Hz to 5,000 Hz. The airborne receiver decoded that and started to transmit the day code. The radar operator would then see the blip lengthen and shorten in the given code, ensuring it was not being spoofed. The IFF transmitter worked on 168 MHz with a power of 400 watts (PEP). The system included a way for ground controllers to determine whether an aircraft had the right code or not but it did not include a way for the transponder to reject signals from other sources. British military scientists found a way of exploiting this by building their own IFF transmitter called "Perfectos", which were designed to trigger a response from any FuG 25a system in the vicinity. When an FuG 25a responded on its 168 MHz frequency, the signal was received by the antenna system from an AI Mk. IV radar, which originally operated at 212 MHz. By comparing the strength of the signal on different antennas the direction to the target could be determined. Mounted on Mosquitos, the "Perfectos" severely limited German use of the FuG 25a. The United States Naval Research Laboratory had been working on their own IFF system since before the war. It used a single interrogation frequency, like the Mark III and a separate responder frequency. Responding on a different frequency has several practical advantages, most notably that the response from one IFF cannot trigger another. But it requires a complete transmitter for the responder side of the circuitry, in contrast to the greatly simplified system used in the British designs. This technique is now known as a cross-band transponder. When the Mark II was revealed in 1941 during the Tizard Mission, it was decided to use it and take the time to further improve their experimental system. The result was what became the Mark IV. The main difference between this and earlier models is that it worked on higher frequencies, around 600 MHz, which allowed much smaller antennas. Unfortunately, this also turned out to be close to the frequencies used by the German Würzburg radar and there were concerns that it would be triggered by that radar and the transponder responses would be picked on its radar display and thereby give away the operational frequencies. This led to a US–British effort to make a further improved model, the Mark V, also known as the United Nations Beacon or UNB. This moved to still higher frequencies around 1 GHz but operational testing was not complete when the war ended. By the time testing was finished in 1948, the much improved Mark X was beginning its testing and Mark V was abandoned. Mark X started as a purely experimental device operating at frequencies above 1 GHz, but as development continued it was decided to introduce an encoding system known as the "Selective Identification Feature", or SIF. SIF allowed the return signal to contain up to 12 pulses, representing four octal digits of 3 bits each. Depending on the timing of the interrogation signal, SIF would respond in several ways. Mode 1 indicated the type of aircraft or its mission (cargo, for instance) while Mode 2 returned a tail code. Mark X began to be introduced in the early 1950s. This was during a period of great expansion of the civilian air transport system, and it was decided to use slightly modified Mark X sets for these aircraft as well. These sets included a new Mode 3 which was paired with a civilian Mode A, which operated similar to the original Mode 2 and returned a four-digit identifier. Because Mode 3 and A are identical, they are normally referred to as Mode 3/A. A further addition, Mode C, returned the altitude encoded in a single 12-bit number in Gillham code, which represented the altitude as (that number) x 100 feet - 1200. Mode B and D were specified but never used. The current IFF system is the Mark XII. This works on the same frequencies as Mark X, and supports all of its military and civilian modes. The main reason for the creation of Mark XII was the addition of the military Mode 4. Before Mark XII, the transponders would respond to any properly formed interrogation signal, broadcasting a reply that could be picked up by any receiver. Using triangulation, an enemy could determine the location of the transponder. The British had already used this technique against the Germans during WWII, and it was used by the USAF against VPAF aircraft during the Vietnam War. Mode 4 started with an interrogation similar to Mode 3, but then followed that with an encoded pulse chain similar to the one used in Mode 3/A. The receiver side of the transponder checks this code against a known day code, and only responds if the two match. The pulses in the reply are delayed based on the received code. This largely eliminates the ability for the enemy to trigger the transponder. During the 1980s, a new civilian mode, Mode S, was added that allowed greatly increased amounts of data to be encoded in the returned signal. This was used to encode the location of the aircraft from the navigation system. This is a basic part of the traffic collision avoidance system (TCAS) system that allows commercial aircraft to know the location of other aircraft in the area and avoid them without the need for ground operators. The basic concepts from Mode S were then militarized as Mode 5, which is simply a cryptographically encoded version of the Mode S data. The IFF of World War II and Soviet military systems (1946 to 1991) used coded radar signals (called Cross-Band Interrogation, or CBI) to automatically trigger the aircraft's transponder in an aircraft illuminated by the radar. Radar-based aircraft identification is also called secondary radar in both military and civil usage, with primary radar bouncing an RF pulse off of the aircraft to determine position. George Charrier, working for RCA, filed for a patent for such an IFF device in 1941. It required the operator to perform several adjustments to the radar receiver to suppress the image of the natural echo on the radar receiver, so that visual examination of the IFF signal would be possible. By 1943, Donald Barchok filed a patent for a radar system using the acronym IFF in his text with only parenthetic explanation, indicating that this acronym had become an accepted term. In 1945, Emile Labin and Edwin Turner filed patents for radar IFF systems where the outgoing radar signal and the transponder's reply signal could each be independently programmed with a binary codes by setting arrays of toggle switches; this allowed the IFF code to be varied from day to day or even hour to hour. The United States and other NATO countries started using a system called Mark XII in the late twentieth century; Britain had not until then implemented an IFF system compatible with that standard, but then developed a program for a compatible system known as successor IFF (SIFF). Mode 1 – military only; provides 2-digit octal "mission code" that identifies the aircraft type or mission. Mode 3/A – military/civilian; provides a 4-digit octal identification code for the aircraft, assigned by the air traffic controller. Mode 4 – military only; provides a 3-pulse reply, delay is based on the encrypted challenge. Mode 5 – military only; provides a cryptographically secured version of Mode S and ADS-B GPS position. Modes 4 and 5 are designated for use by NATO forces. ^ "MEADS System Gains Full Certification for Identifying Friend or Foe Aircraft". Lockheed Martin. Archived from the original on 2016-03-04. Retrieved 31 May 2015. ^ "Identification Friend or Foe". Global Security. Retrieved 31 May 2015. ^ "Combat Identification (IFF)". BAE Systems. Retrieved 31 May 2015. ^ "Joint Publication (JP) 3-09, Joint Fire Support" (PDF). US DoD. 30 June 2010. p. III-20. Archived from the original (PDF) on 2014-04-11. Retrieved 27 December 2013. ^ "General IFF principles". United States Fleet. 1945. Retrieved 2012-12-17. ^ "The British invention of radar". Retrieved 2012-12-17. ^ a b Lord Bowden (1985). "The story of IFF (identification friend or foe)". Physical Science, Measurement and Instrumentation, Management and Education - Reviews, IEE Proceedings A. 132 (6). Retrieved 13 July 2014. ^ Proc, Jerry. "IFF System History". The Web Pages Of Jerry Proc. Jerry Proc. Retrieved 5 November 2018. ^ George M. Charrier, Recognition System for Pulse Echo Radio Locators, U.S. Patent 2,453,970, granted Nov. 16, 1948. ^ Donald Barchok, Means for Synchronizing Detection and Interrogation Systems, U.S. Patent 2,515,178, granted July 18, 1950. ^ Emile Labin, Magnetostrictive Time-Delay Device, U.S. Patent 2,495,740, granted Jan. 31, 1950. ^ Edwin E. Turner, Coded Impulse Responsive Secret Signalling System, U.S. Patent 2,648,060, granted Aug. 4, 1953. Wikimedia Commons has media related to Identification friend or foe.